Fine Arts Center Blog: NEW Acquisition: William Kentridge's "Drawing from Tide Table"
NEW Acquisition: William Kentridge's "Drawing from Tide Table"
William Kentridge, Drawing from Tide Table (Feet), charcoal on paper, 2003 . 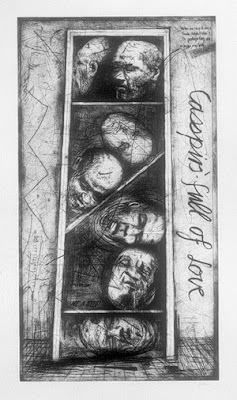 An example of Kentridge's apartheid-informed art. 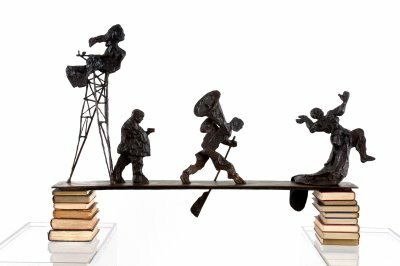 Contemporary South African artist William Kentridge's emphasis on the PROCESS behind his art sets him apart from artists who focus on the finished product. Kentridge will photograph the process behind his charcoal drawings or paper collages as they develop. He translates this photography to his animation process, where he records every change or addition towards the final film. He exhibits the recordings of his process alongside the finished pieces of art, believing the steps leading up to the final stage are instrumental in understanding art. 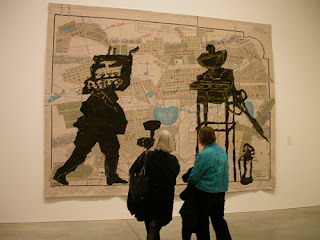 Kentridge works in a variety of mediums, including film, drawing, tapestry sculpture, animation, opera, and performance. As an expressionist, the form his art takes complements the subject matter. Many of Kentridge's works are informed by his growing up during the fall of apartheid in South Africa. Of Lithuanian-Jewish heritage, Kentridge was born in 1955 in Johannesburg to prominent South African civil rights lawyer Sydney Kentridge. His father fought against apartheid and defended many victims of apartheid, like Stephen Biko. PBS's Art21 featured Kentridge and his very different video projection process featuring an opera singer and torn paper choreography. Here's a link. In 2009, the San Francisco MoMA held a Kentridge exhibition, a year before the FAC's William Kentridge, The World is Process. "The job of the artist is to fight against entropy – to keep on taking these fragments and say, ‘What can they become?’ To take the fragments and construct something provisionally new. And that’s the link from memory, to fragments, to the activity of making." Philadelphia Museum of Art (image source). Stop by the galleries to check out this new acquisition, along with the EIGHT other exhibitions we have going on!